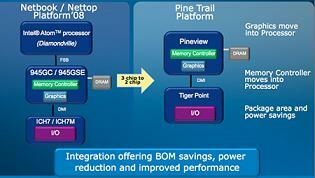 We have been mentioning about Pine Trail earlier and now seem that there is more concrete plan on this next generation Atom processor, which is targeted to replace Intel Atom N270 series. The most recent news disclose that the Pine Trail is officially named as Atom N450, while the Tiger Point chipset named as NM10 with availability to board vendors by October this year. As expected, the new processor and chipset combo will be shrunk into two-chip solution from original three-chip solution with Atom N270 pairing with ICH7M IO Hub and 945GSE chipset. With only two-chip solution, both the memory controller and graphics core will be integrated into silicon core itself, which significantly improve the overall performance while reducing both the foot print and thermal dissipation. Interestingly, both N450 and NM10 will be fabricated using smaller process technology of 45-nm instead of older processor technology of 130-nm especially on relatively older chipset such as 945GSE and US15W chipset. The last order for N270 will happen on first quarter of 2010, so that the giant chipmaker can fully move into its N450 mass production, hoping to continue the momentum of its famous Atom family processors suitable for both embedded and consumer markets.